There are 9 different 12-bit Digitizer cards in the UF2e-3100 range. Cards are available offering 2, 4 or a unique 8 input channels and choice of maximum A/D sampling rates. Each channel is simultaneously sampled through independent 12-bit A/Ds and has eight software selectable input ranges from ±50mV to ±10V, that can be independently set for each channel. The UF2e cards are used as lower cost, more flexible and deeper memory alternatives to oscilloscopes and transient recorders. The fast PCI Express bus gives direct integration with your preferred PC software, while the 120 MBytes per second data transfer delivers faster test times. The UF2e cards use a x1 PCIe connector. They can be used in PCI Express x1/x4/x8/x16 slots, except special graphic card slots, and are 100% software compatible to Conventional PCI > V2.1. The maximum sustained data transfer rate is 160 MByte/s per slot. 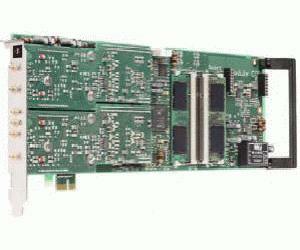 PCI/PCI-X models also available (UF2-3100). Although we prefer the term Waveform Digitizers (often shortened to Digitizers), other manufacturers may call their products Transient Recorders or PC Oscilloscopes. In any event, the all of these are used to record analog signals at high-speed and with professional instrumentation accuracy.